The relationship between a customer and an irrigation business is pretty straightforward when it’s a simple installation. But it becomes a bit more nuanced when the relationship shifts from project-based to service-based. The range of issues and services you provide widens. And when this happens it’s a good idea to have a thorough agreement that covers everything that can possibly happen. This doesn’t mean it has to take up a lot of your time but it can save you - and your business - from a great deal of trouble in the end. What you’ll find in the sections below is everything an irrigation company could possibly want (or need) to include in their contract. I thought it would be better to be thorough, than to skim over the topic, leaving something out and getting a business sued. It’s likely you won’t want or need to include all of it - it’s quite exhaustive. QUICK DISCLAIMER: I’m not a lawyer, below reflects basic advice on irrigation service contracts. If you have further questions or concerns it’s always best to reach out to a real attorney that’s passed the BAR. What will you be doing for the customer? This is where you include all the services - from start-ups to in-season check-ups to blow-outs - you’ll be providing the customer. It’s super important to be clear during this portion of your irrigation service contract. By explaining what’s included, you set the parameters of your agreement with the customer. Meaning, they now know what you are and aren’t responsible for. As you’re well aware most irrigation businesses price services in two ways: flat-rate or time and material. So how your contract presents your price(s) might be different to that of another irrigation business. Whatever way you decide to price your services it’s important to clearly define how much the customer is being charge and why the cost is what it is. This may include listing your hourly rates of technicians or simply stating how much a start-up (or winterization) is going to cost. How do they pay? What if they don’t? Somewhere in your contract you’ll want to include invoice-related details. You should clearly state how they can pay (e.g. check, cash, credit card, direct debit), what their pay period is (e.g. 30 days of the date of invoice) and what happens if they fail to make a payment (e.g.services will cease until payment is made or all balances 15 days or more past due are subject to a certain service charge). Vice-versa, it’s a good idea - especially if you offer auto-billing and auto-payments - to state how you’ll return any payments made on mistaken charges. 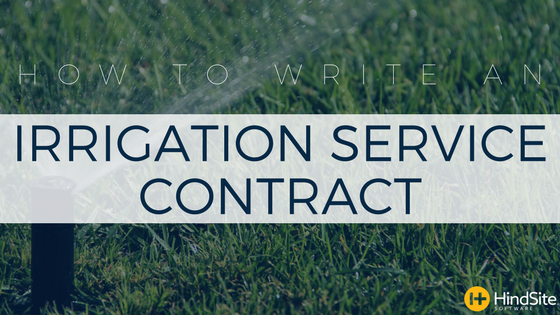 Like any legally-binding documents, it’s vital to clarify any ambiguities in your irrigation service contract. This varies, but can be anything from special provisions to modifications or amendments to who’s responsible for certain damages to causes of termination to insurance coverage.